THE IRISH AVIATION Authority (IAA) has announced that drones are banned from flying above the Trevor Deely search site in Dublin until the end of the month. A statement issued by the IAA said that the Department of Justice requested that a restriction be put in place around the area, which is close to Chapelizod, for reasons relating to security. 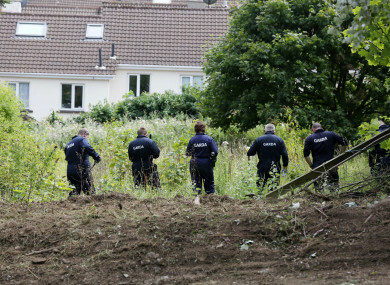 Gardaí have been examining a site at wooded land in the area since Saturday. Gardaí said they had received significant information which led them to the area. A gun has since been recovered. Detective Inspector Paul Costello said on Saturday that gardaí had begun the search as a result of new information they obtained. He described it as the most significant search operation to be carried out since Trevor’s disappearance in December 2000. Costello said he could not discuss the nature of the information which led gardaí to the search in Chapelizod. However, it has been reported that gardaí were told a criminal killed the 22-year-old the night he went missing and buried his body in the area, sparking the renewed investigation. The area was sealed off and blocked from public view at the weekend. Black tarpaulins have been placed on railings at the south perimeter of the land, which slopes down to the River Liffey from the R112, just off the Chapelizod Bypass. The site has been the focus of sustained media attention since the launch of the search on Saturday – with reporters, TV crews and photographers often present at a temporary entrance which was set up for use by gardaí. The land comes under the management of South Dublin County Council. “The Minister of Transport [Shane Ross] acceding to a request from the Department of Justice and Equality for reasons related to security, has directed the Irish Aviation Authority to give effect by means of an airspace direction to any requests made (by the Department of Justice and Equality) in relation to the establishment of temporary prohibitions and/or restrictions in areas of Irish airspace over land areas associated with a security operation. A restriction (temporary restricted area) on the flying of aircraft, including small unmanned aircraft as defined in SI No 563 of 2015, shall apply in airspace over Chapelizod Demesne, Dublin 20, Dublin City within the under mentioned lateral limits: Circle Radius 1 NM centred on 53° 21′ 06.88″N 006° 22′ 17.59″W. Trevor Deely went missing after attending a Christmas party on 8 December 2000, and was last spotted on CCTV footage which showed him crossing Baggot Street Bridge and walking towards Haddington Road in the city centre. The investigation is being headed by officers from Pearse Street Station. Detectives have begun the process of re-interviewing family and friends to try to unearth new information. Any person who has information about Trevor’s disappearance can contact Crimestoppers on 1800 25 00 25. Email “Drones banned from flying over Trevor Deely search site”. Feedback on “Drones banned from flying over Trevor Deely search site”.